I could count on one hand (and have fingers left over) the number times we went out to eat at a restaurant when I was a child. But the one place where we did go was to church suppers. And so I retain a fondness for this sort of event. Unlike chef-driven restaurants, the food has a certain humble and sincere appeal. Driven by both a fund-raising need, and the desire to please and share, I am happy to be part of the experience. Pteri went with me to this event, a full fledged church festival, complete with booze, booths of items for sale and dancing. 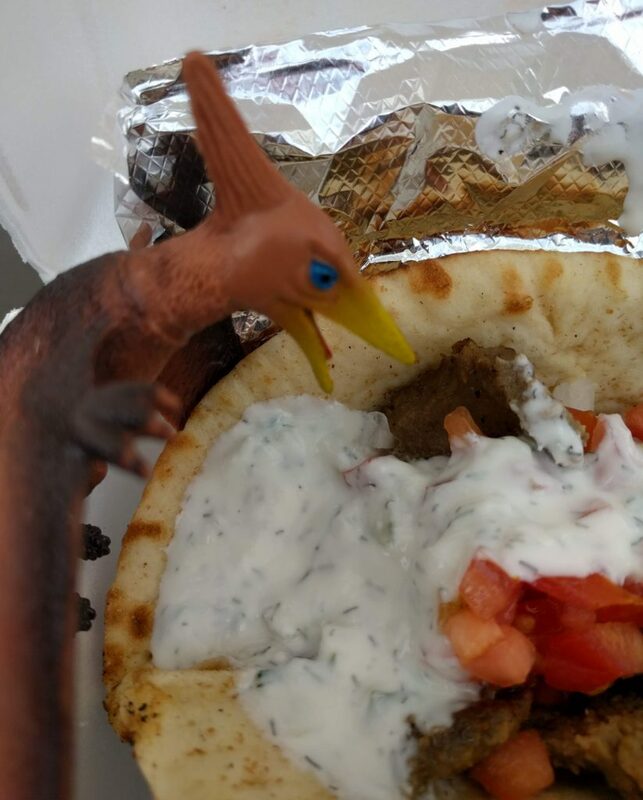 It was a celebration of one’s (not mine though) Greek heritage, so on the menu this day was delicious gyros prepared by members of the congregation and a local restaurant. 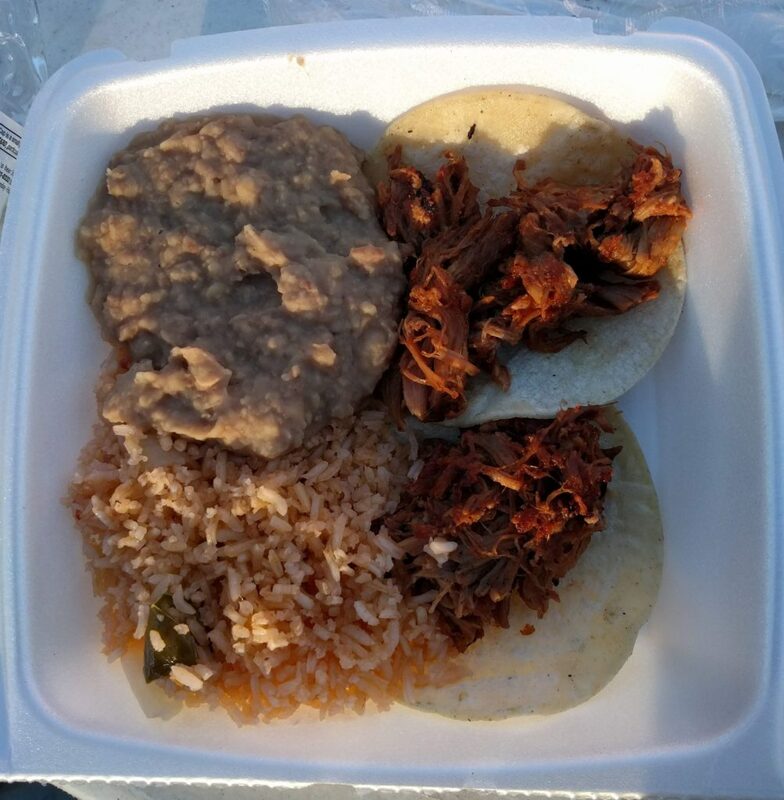 This was a different sort of church dinner, prepared by some men from the sister Spanish language church of this congregation. 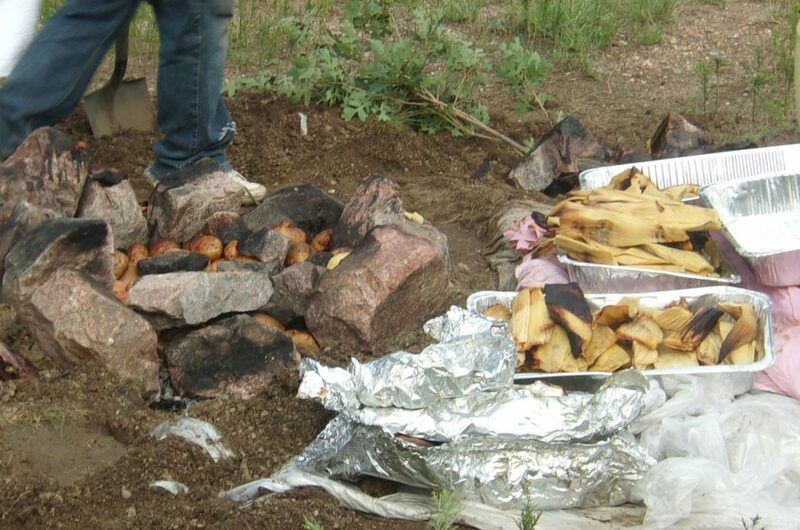 The guys had dug a pit, lined it with rocks, lit a fire to heat up the rocks, then buried the food on the hot rocks to cook it. They had made tamales, potatoes, chicken and pork. This was what they thought of as a perfect church supper back home. As the parent church did not condone alcohol, the men surreptitiously passed a bottle around. This church food came from an Orthodox church out on the prairie, 7 miles from a small town (which is really far from anywhere). The area was settled by Czech farmers, and although most of them have moved away, lots of old-timers come back for a chance to eat this food. 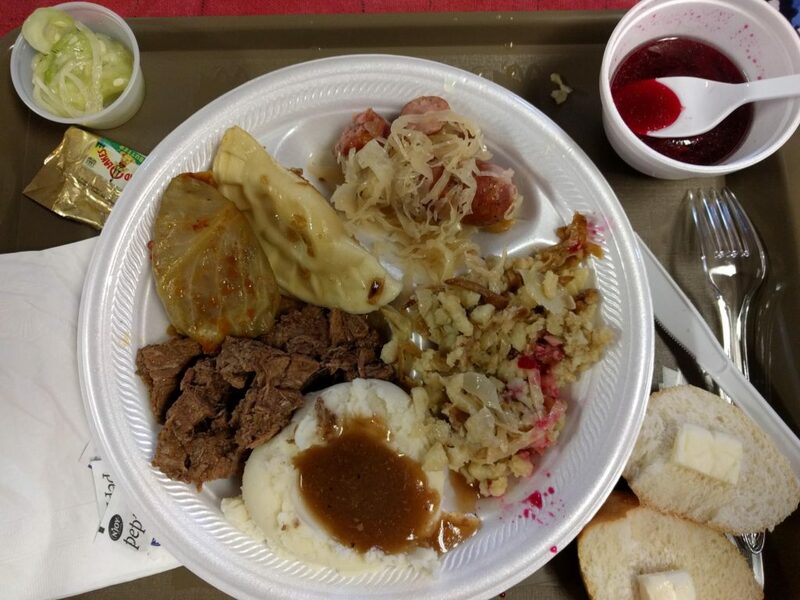 Kielbasa, haluska (some sort of noodle, onion and bacon dish), pierogi (potato and cheese dumplings), cabbage rolls, and borscht (plus some things I don’t know the name of) were on the menu. 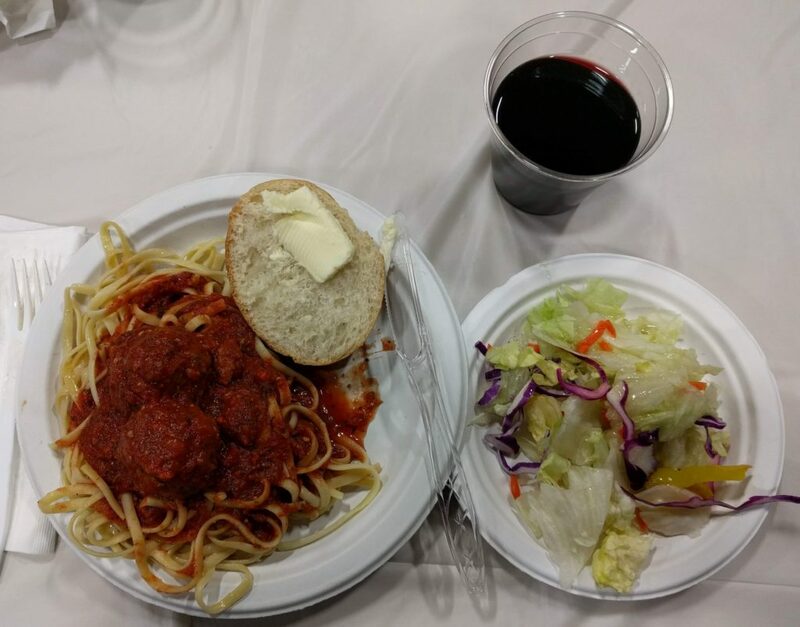 And this was what was served at the most recent church supper I attended, with food cooked up by a local family-run restaurant and served by a parent’s group. This restaurant has been in business since 1959, which makes it quite an ancient establishment in this town. And served in a plastic cup was an excellent vintage wine. It is interesting that all of these meals were based on immigrant/ethnic foodstuffs. All of these varied churches are looking to make a little money (sometimes very little), and provide a place for the community to break bread together. What could be a better excuse to get together? We seldom went out to eat at a restaurant when I was a child. My daughter and I ate at McDonald’s (not really a restaurant) once a week after her piano lesson. I always had a filet-o-fish sandwich. My granddaughters, now teenagers, have eaten at restaurants hundreds of times starting when they were very small.